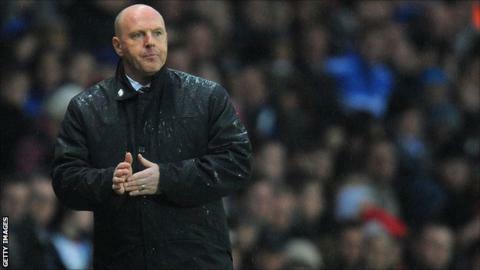 Steve Kean will remain in charge of Blackburn Rovers for their Championship fixture away at Charlton on Saturday. It is understood Kean was spared the sack by co-owner Anuradha Desai, but his position remains under review. Became manager following the dismissal of Sam Allardyce in December 2010 and has faced fierce supporter protests for much of his reign at Ewood Park. Has won 21, drawn 16 and lost 37 of his 74 games in charge. Could not save Rovers from relegation in May, ending the club's 11-year stay in the Premier League. Led the Championship prior to Friday's defeat by Middlesbrough - their first league loss of the season. When asked if Kean would be in charge in the long term, global advisor Shebby Singh told BBC Sport: "No comment." Reports on Monday suggested Kean was on the brink of exiting Ewood Park after Blackburn were beaten in the league for the first time this season. Singh has admitted that the matter could have been handled better and said the situation at the club "gets worse by the day". Speaking to BBC Radio Lancashire, he said speculation about Kean's future "built up so fast it was quite difficult to step in and react". He added: "We have people heading up different departments whose responsibility it is to step in but unfortunately it escalated at such a fast pace that, before you know what happened, it hits you in the face. "It should not have been allowed to escalate like that but it did and the situation gets worse by the day." A crowd of 13,405 saw Friday's match, around 9,000 fewer than the average attendance they were attracting in the Premier League in 2011-12. Many supporters have said they will not return until Kean is dismissed. Singh continued: "Financially now it is not a good situation because the fans are staying away. The club needs revenue to survive. "I guess with having played seven games now I think it is a situation which is not a very pleasant one and I suppose it is my bosses, the owners of the club [Venky's], who have to make an assessment."